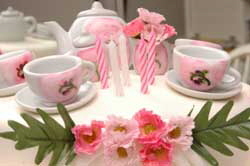 The Tea Party by Birthday Party Ideas. Favors: Finish with a gift and a thank you. Party favors are loved by everyone and say thank you for coming. In fact, adding a thank you to every favor bag, or sending them out after a party is always polite and appreciated gesture. A tea cup cake is always popular with those who like to bake. For those who prefer a simple and less complicated treat, individual cupcakes and ice cream in individual cupcake liners can reduce the mess of serving treats under pressure. The Cake: The grand finale. Party Snacks: Food and drinks can be fun too. Don't forget the snacks and drinks for all of your tea party guests. 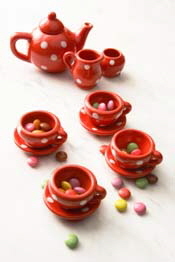 Tiny finger food snacks and sweet flavored tea drinks or lemonade are always top of the list. But it's also fun to have some sweet pastries and fruit. 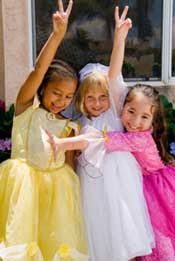 A tea party just isn't the same without all the guests dressed with some fancy tea party dresses. 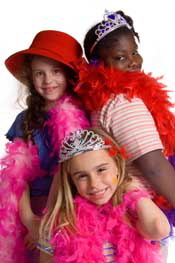 If you are throwing a tea party, be sure to include a hat or tiara! What tea party is complete without some tea party games and events. Games like hot teapot, pin the cup on the saucer, tea bag toss or sugar cube relay, add excitement to the party and provide a time for everyone to interact. Sometimes the memories are even more special when guests get to take home the artwork that they've created themselves at the party. 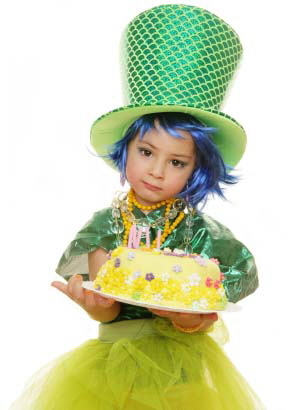 Whether they decorate tea party hats, tiara, or a special decorative item, it will be something special that helps them remember and share their event with others. Decorations: Decorations set the mood. Set the mood for your party with great decorations like a garland archway and play some fun soothing music. Cover the party table with a flowery tablecloth and a beautiful centerpiece. 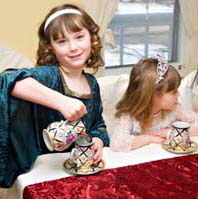 Create a beautiful tea party setting for your guests to enjoy the finger sandwiches and tea. 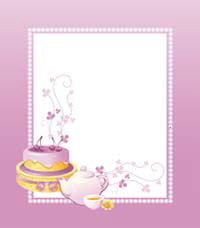 Tea party invitations can be a tea cup, a tea party hat or just a beautiful tea party designed card. Just be sure to make them really special by using a fancy font and graphics that support the theme. Be sure to give the start time, end time, date and location of the Tea Party. All little ladies dream of having a tea party, dressing up and sitting down at a beautiful table with china cups and flowery table accents. So get ready to put on your fancy dress and a tea party hat because the ideas you need to throw a beautiful Tea Party are all right here! Transform your home or backyard patio into a family fun pastel colored tea party getaway. 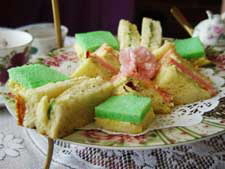 Serve tea, lemonade or punch along with dainty finger sandwiches and fruit. Your little Tea Party guests will be over the moon. 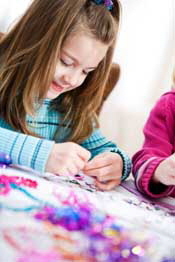 All the ideas you need for the perfect Tea Party are divided into the sections for invitations, decorations, activities, games, costumes, favors, refreshments and cake. Read through the ideas and use the ones that work for you!